BTC-Guardian | 2017 – The year of bitcoin? 2017 – The year of bitcoin? Home » Blog»com&spo » 2017 – The year of bitcoin? Next Thursday, 6 pm CET, I’ll talk again about Blockchain’s potential. This 4th edition will be in our hometown Vilanova i la Geltrú, within Campus Universitari de la Mediterranea learning and conferences program. From Catalunya to Euskadi to cover the last of the 3 provinces. After Álava and Vizcaya, I will be at Enpresa Digitala (SPRI – Euskadinnova) en Arrasate/Mongragón – Guipúzcoa, February, 7th. Knowledge of the world’s changing technology is spreading steadily with no doubt. 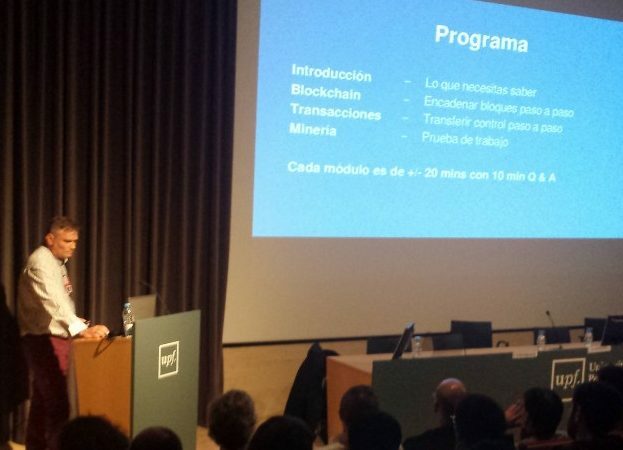 I remember Andreas Antonopoulos telling us in Barcelona that mass adoption would take more or less 20 years, which currently is more than 10 years still. Against my beliefs and preach bitcoin is consolidating as a financial asset rather than a medium of exchange. Early 2015 I wrote about general media declaring bitcoin’s death while trading for less than 200 USD. Since November of that same year, its trading value has risen to close to historical high at $1200 (6x more) early this month. Honestly, at this stage, after 8 years into the game, these alphanumeric strings which represent nothing else than zeros and ones (or on/off state) point to one number among 10 raised to the 58 power, trade in numerous marketplaces because the holder can be certain that these strings stand for solid FX rate against any FIAT currency of the planet. After 3 years in business, BTC-Guardian has followed and witnessed parallel crypto and blockchain environments similar to Bitcoin developed. These, with other functionalities and goals, have grown faster and penetrated general media more efficiently: Ethereum, ZCash or Monero are sound examples that the blockchain technology is here to stay. To me, the question, though (which for me had always the same answer) is if genuine adoption will come thru private, exclusive or permissioned blockchain environments or the public, free and inclusive ones. Can governments, legislators, regulators or oligopolies fence the open and free world wide web and advanced mathematics? Probably not. As a matter of fact the more the first ones push to get their ‘Blockchains’ integrated with their business models, the more refined the peer to peer ‘value transfer’ ecosystems will become thru smarter developments of the latter. The only handicap is, that this technology will become though freely available, practical only for cultured minorities, critical with conservative environments and with high academic level. Definitely, the coming years will witness the clear split between State, banks and oligopolies with their blockchain interpreted ecosystems, anchored in conservatism and patching with slow development against the smaller, faster, nimbler and smarter developments by the citizens (CC, GitHub, open repositories, etc) for the citizens.